Though he was fighting some 80 miles from his home, there was no shortage of support behind Anthony Scandy of Jack Loew's Southside Boxing Club who was making his amateur debut in Cleveland at the Battle In The Ballroom 26 with trainer Vinny O'Neill in his corner. Scandy, who is currently a senior at Youngstown State University where he plans to graduate from in May with his bachelors of Science in Nursing, showed he is no stranger to performing on a big stage as this was not the former Springfield Local football standouts first rodeo between the ropes. Back in early August Scandy participated in the Rough N' Rowdy Brawl put on Bar Stool Sports, an event that sold out the Covelli Center. 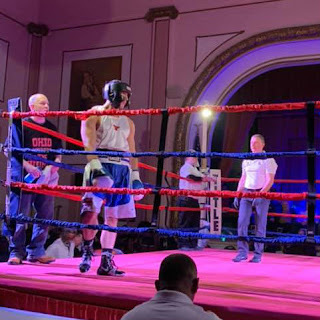 Like his fight at the Rough N' Rowdy, Scandy was the one getting his hand raised in the end with a TKO victory as he was able to stop Operia Hill of Lorain in the second round of their 165-pound bout. The TKO victories were the only like comparisons which Scandy had between his amateur debut and his fight at the Rough N' Rowdy. "The biggest difference between the amateur fight and the Rough N' Rowdy were the length in rounds going from one minute to two minutes so in amateur, you and your opponent got more time to work in the ring", said Scandy. The extended time for rounds also affected how Scandy trained for this fight, something he did very little in the summer for his Rough N' Rowdy appearance because of his workload doing landscaping. "I only trained hard for two weeks last time with no sparring", stated Scandy. "I trained for a full five weeks for this fight and I trained much harder, running 2-3 miles a day at minimum, got some lifts in when my body felt like it needed to stay powerful, and did some light calisthenic work like circuits of pushups, pull-ups, and sit-ups". His training for The Battle in the Ballroom didn't stop at getting physically ready as he was able to get his timing ready with some sparring and his mind sharp and fight ready as well. "I sparred 10-plus rounds leading up to this fight and felt more prepared and comfortable to fight," responded Scandy when asked about what he did to prepare for the bout. "My father and my trainer were also educating, critiquing, and working with me in the gym daily, which was the biggest help I could have gotten". Though Scandy made his victory look easy with the second-round stoppage, he was the first to quickly point out his mistakes. 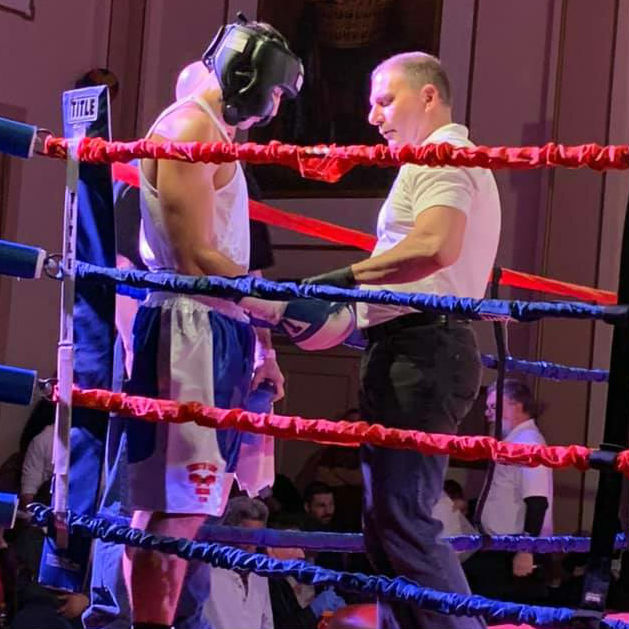 "I took a few punches in the first round that caught me off guard and then resorted to brawling and throwing punches," said Scandy in talking about his victory. "I didn’t plan to look as wild as I did and let go of the basics but after the first round my trainer told me I was better than that and that I knew better, so I went out and kept my range and boxed like I was originally supposed to and got the job done".